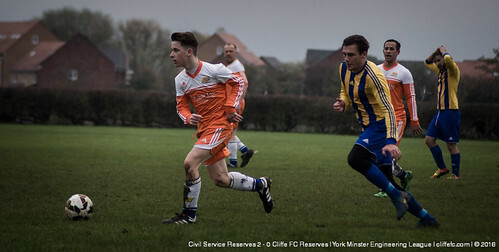 Only one Cliffe FC fixture went ahead this weekend, Cliffe FC Reserves going down to a 2-0 defeat at Civil Service Reserves. With the first team game and Sunday game postponed as Oxen Lane drainage works are completed, all eye were on the Reserves’ trip to Civil Service at York College. Cliffe matched Civil Service from the outset, and if you weren’t told which team resided higher up the table, you wouldn’t have been able to split the sides. Both teams had chances, Civil striking the bar in the opening minutes, and Kieran Dinsdale tested the home ‘keeper. 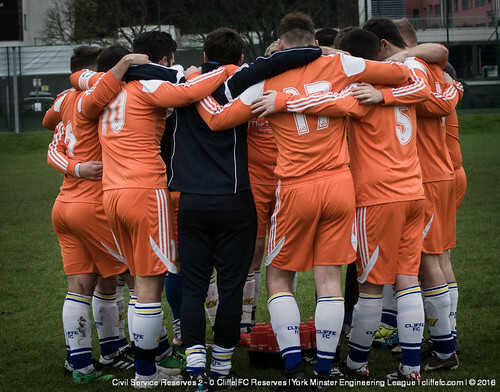 As has been the theme of their season, Cliffe eventually were guilty of not taking their chances when on top, as the half-time whistle crept up on the team in orange, 0-0 HT. Cliffe again matched their hosts and as it remained 0-0, it was hard to tell which way the game would go – a tale of two penalty shouts would swing the way of the hosts. First Dinsdale, who had impressed all day, went down in the box/edge of the box but neither a free-kick or penalty was awarded. Minutes later Civil had a penalty decision go their way, penalty awarded and converted by their captain for 1-0 – a cruel blow to Cliffe. Cliffe now had to open up to chase, Isaac Leach coupled with Dinsdale looked most likely to get Cliffe back into it. As football goes, by opening the game to chase, Cliffe left themselves open and were picked off in the last few minutes, Civil scoring on the break for 2-0. 2-0 being the final scoreline. MOTM was awared to Isaac Leach, playing in the same side as his dad, Simeon. Next week, all three Cliffe FC sides are scheduled for action. First Team travel to Tockwith, Reserves host Rufforth United, Sunday side are away to title favourite Malt Shovel.